Celebrate this very special time of year with a beautiful gift of flowers. Send flowers at Easter to friends and relatives in Sheffield and surrounding areas.We hand deliver all our floral arrangements thus ensuring freshness and quality. 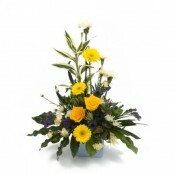 What's more we are delivering flowers on the Thursday before Good Friday or on Easter Saturday. This year our Easter floral arrangements include delightful yellows and golds.